"I'm leaving on a high note," Tennis Australia's departing IT chief, Samir Mahir tells CIO Australia. In just over four years, Mahir steered data-driven innovations at the organisation that have significantly improved the experience for tennis fans and media at its marquee event, the Australian Open. Last month, Tennis Australia won the 2015 Victorian iAwards for delivering digital technologies, mobility and social networks for this year’s tournament. Mahir has been involved in delivering IT and technology for tennis events since the mid-1990s, having worked as IT director for the United States Tennis Association from 1996-1999, then on project managing the Tennis Grand Slam Tournaments along with other sporting events with IBM Atlanta in 1999 to 2011. Mahir tells CIO that he will now turn his attention to other industries as a consultant. “There’s definitely opportunity to learn about certain industries or to go back to other industries and spend some time in [them] again. Maybe consulting will give me that flexibility to see what’s happening and what’s going on out there," he says. Mahir knows not only the IT needed to pull off a major tennis event, but also knows the game itself, having played tennis tournaments and coached other players before taking up a job at US Tennis Association. “It’s an interesting combination because sports in general, not just tennis, is hungry for technology. "They are very curious about what technology could be used to grow the sport or to manage and event or help programs. There are a lot of rankings, there are a lot of stats, there are a lot of data. So it’s a good environment for technology to thrive, to leverage technology to serve the business of tennis,” he says. Mahir has always had a strong interest in delivering well designed content through technology, which was first spurred on during his childhood of growing up in Morocco where he was always surrounded by a vast array of colours and design and meaningful content. This is what attracted him to work in the sporting events business where it’s all about delivering visually compelling stats and information that help people further engage in the sport. 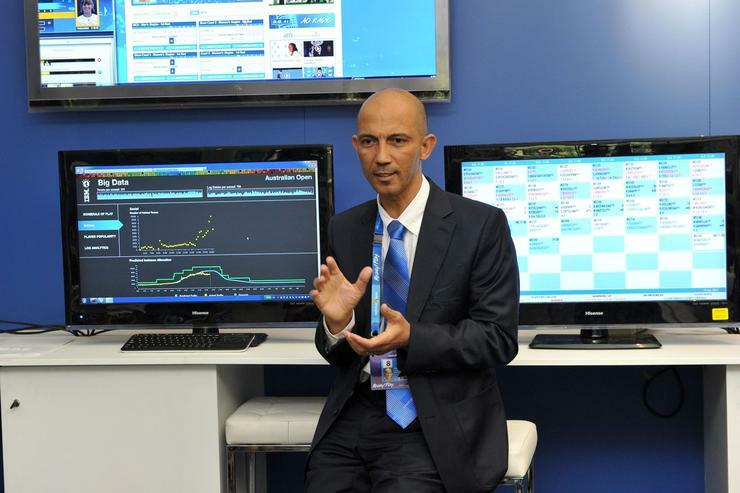 During his time at Tennis Australia, Mahir introduced new features to the app and websites for the annual Australian Open event to increase fan engagement and deliver stats to them in interactive ways, working with IBM technology. The SlamTracker app he helped develop visualises data and statistics from the event, using eight years of historical data on players and the game in combination with real-time statistics during the tournament. It features player and ball movement information, as well as suggesting three key things a player needs to do in order to win the match. Mahir introduced IBM Watson into Tennis Australia’s operations to accurately predict what compute power is needed at different stages of the tournament. The supercomputer looks at game schedule, player data and historical information to determine if there’s a need to boost compute capacity to support the game’s digital services to fans. He also deployed Watson to provide media with real-time insights about players and games so that journalists could access historical statistics or real-time information through it. With the Tennis Australia websites, Mahir deployed application performance and availability monitoring technology to cut its issue management process by 50 per cent, resulting in people staying longer on the sites. Mahir says to successfully pull all this off he has to balance the innovation with the underlying technology that supports all that. “There’s that constant juggling of business as usual versus innovation. What you have to do as CIO is set up the right process, the right team, the right procedures to handle that. “The good thing about the Australian Open and events like that is they force the organisation to think of innovation and new things. “But don’t get me wrong, business as usual is always going to be there. People sometimes tend to forget, without business as usual you cannot really drive or support the infrastructure that needs to be up and running to do the new things, to allow you to go and spend time on innovation,” he says. Proactive communication, where he was in regular conversation with other executives and stakeholders, was also a key part of his role at Tennis Australia. “The only way to survive is to be involved in the strategic initiatives in the company. Don’t wait for somebody to tell you what’s happening or what’s going to happen next month. Have that open conversation almost on a daily, weekly basis with people at all levels, not just at the executive level,” he says. “You’d be surprised how much and how some very great ideas come from staff, and how you can turn it around and enable it and make it useful and innovative, and put the resources behind it,” he adds. Looking back to the early days of his career, Mahir says it was easy to get too excited and make the mistake of committing to too big of an innovation too soon. “Sometimes people get too excited early on in their career and say they can do everything and anything and do it fast and commit to things early. But there can be some really complex projects that need backing from many people and many resources, many skill sets. “You have to sometimes question certain things, you have to do your research, you have to base it on facts. We are not in the business of being nice all the time. You have to think about risk and risk management. Don’t give false expectations. Managing the expectations properly and meeting expectations are important,” he says.